This simple vegetarian soup bursts with garlic, both roasted and simmered. It's a satisfying, bold soup equally worthy of kicking off a fancy dinner party or completing a quiet, cozy evening at home by the fire. Oh, and it will probably also help you ward off vampires. Bonus! Food bloggers as a lot tend to wax super-duper poetic about every single recipe they post. I mean, if they don’t love what they’re sharing, they probably wouldn’t blog it to begin with, right? Every once in awhile though, it feels a little … well, almost fake … when I find myself writing yet again about how utterly fabulous this pasta dish is or the transcendent, life-altering qualities of this sangria. But the fact is, it’s not fake. I’m pretty much in love with just about every recipe I post. I’ve usually spent weeks, sometimes months, making and remaking and tweaking until I think it’s just right. So I guess the fact that I find myself going on and on about how tasty and perfect a dish shouldn’t be a huge surprise to me. But I guarantee that as I write up this week’s batch of posts, I’ll sigh yet again as I type more glowingly elaborate food descriptions. This recipe, though? It’s extra amazing. Extra utterly fabulous. Extra, yes, life-altering and transcendent. The heavens open up, light shines, angels sing. Seriously, it’s quite possibly the best soup I’ve ever tasted – and certainly the best soup to ever come out of my kitchen. It’s garlicky. You’re aware of this – you saw the title of this – it’s got 40 garlic cloves. 40! 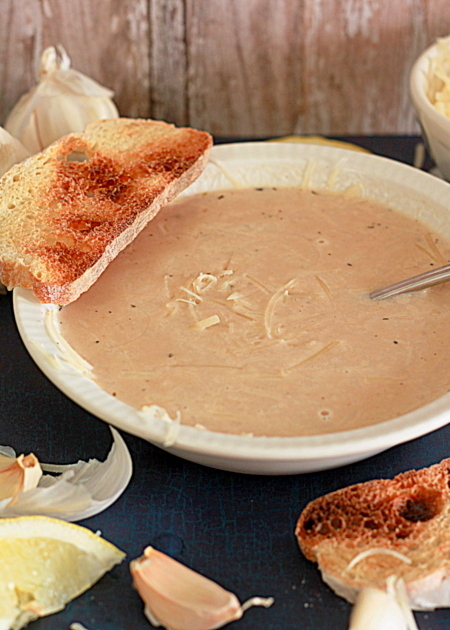 Yes, you will probably smell like garlic for a day or so after eating this soup. Yes, you know it’s worth it. It’s such a simple soup, and therein lies the beauty. 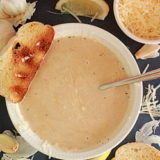 Onions, thyme, and rich vegetable broth provide the stage for the obvious star – garlic cloves both roasted and simmered. The pour of whipping cream, squeeze of lemon, and sprinkle of Parmesan respectively highlight the sweet, buttery, nutty notes in the garlic. No faking, here. This one is a must-try. As far as the size of the garlic goes, I kept forgetting to weigh my heads of garlic so that I could give you an estimation. I think as long as your cloves aren’t super-small or you’re not using elephant garlic, your soup should come out just fine. Preheat oven to 350 degrees Fahrenheit. Cut the top(s) off of your head(s) of garlic and separate out 25 cloves, making sure each clove has an end chopped off (this will help with squeezing out the roasted garlic later on). Place the 25 cloves in a small glass baking dish, pour the 2 tablespoons of olive oil over the top, and sprinkle with a little salt and pepper. Toss to coat. Cover the baking dish with foil and bake for about 45 minutes, until cloves are light golden brown and very tender. Remove from oven and cool. Squeeze the roasted garlic between your fingertips to release the garlic and discard the peel. Set roasted garlic aside. In a large saucepan, melt the butter over medium heat. Add the onions and thyme; cook until onions are soft and translucent, about 5 minutes. Add both the roasted garlic and the 15 peeled raw garlic cloves and cook, stirring, for about 3 minutes. Add vegetable stock and, continuing over medium heat, bring the soup just to a boil. Reduce heat and simmer, covered, for about 20 minutes, or until garlic is very tender. Remove from heat and cool slightly. Using an immersion blender or working in batches with a blender, puree soup until smooth. Return soup to pan and stir in heavy whipping cream. Season with salt and pepper, to taste. 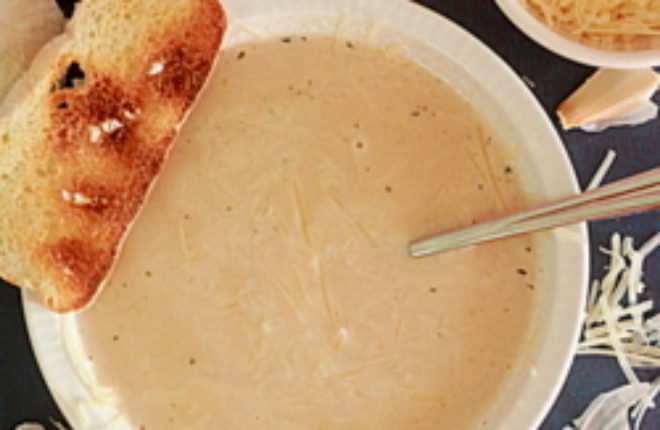 Sprinkle Parmesan cheese into each bowl and ladle the soup over the top. 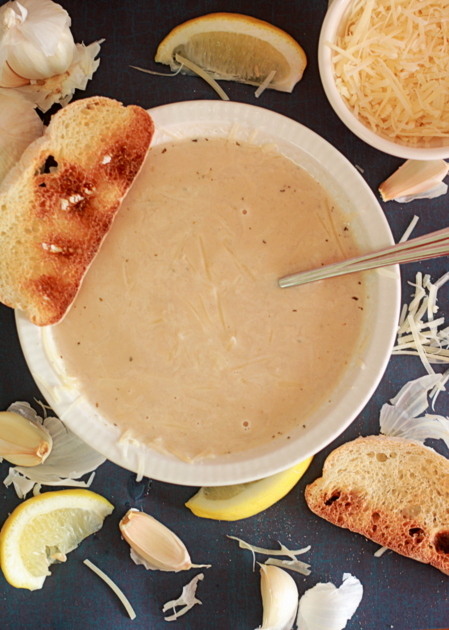 Squeeze one lemon wedge over each bowl and sprinkle with additional Parmesan if desired. Serve. Hey there – I totally understand where you’re coming from about working and reworking a recipe until it’s something you go on-and-on about. And how couldn’t you when there’s 40 cloves of garlic involved…that’s awesome! Hi Bee! Yeah, peeling cloves is a pain! I like to smash whenever possible but that doesn’t really work with the roasted cloves. :\ Thanks so much for the photography compliments! The quality certainly varies, usually with the amount of time I have and depending upon the light, which is a challenge in the darkness of winter. Honestly? This one was taken with my Canon Rebel and a 50mm f1.8 lens (I call it my magic lens – such a bargain for $100 bucks)! I styled it, um, on top of a cardboard box in the foyer with the front door open for light! And I still didn’t have quite enough light (I should really use a tripod, that helps when light is lacking). the angels will sing if 40 cloves of garlic are involved! This is my kind of soup! This soup looks devine, it will definitely keep a cold away (not to mention the vampires). I love that you used both roasted and raw garlic. Yummo! Yes, I’ve been waiting for a cold to strike (as much as one “waits” for a cold) so I can test its healing properties! I don’t go on & on about how wonderful everything I make is. It’s just not me! So I write more about the process or how I came up with the idea. Sometimes I have to remind myself to add a line mentioning that the recipe is good so people don’t think I’m trying to skirt the issue because it’s terrible. 😉 But this one sounds so amazing, I think you are entitled to pat yourself on the back–delicious! I highly doubt it would cross anyone’s minds that you would ever think one of your recipes is terrible – ha! I do hope what I said didn’t come across as insulting to other food bloggers though, especially in light of recent negativity – doh. Hi! Sounds delicious! But I was wondering if it matters what type of onion that you use?? This was a great recipe. Hands down the best soup I’ve ever tasted. Thank you so much for this! I never comment on things like this but WOW this soup is INCREDIBLE!!!!! I made it exactly as the recipe called and my husband and i inhaled it! Thank you for sharing! I may even double it next time! Ha ha ha, I love this comment! I, too, have heard songs from soundtracks when trying certain foods. 🙂 I’m so glad you like it! So, so delicious. Had friends over and ALL four adults and five kids loved it! Thank you! If you didn’t want to use whipping cream, could you sub in coconut cream instead? Thanks! Keith, Did you ever make it with coconut cream? My neighbor Kris brought this for a neighborhood get-to-gather. It was such a smash that all of us requested the recipe. If I had heavy whipping cream on hand, I would have made it right away. I’m positive it would taste better the following day! In our family we appreciate strong flavored and fusion foods. My husband is part Peruvian and Italian and I am from India. Do share similar; easy to make and delicious recipes. Thanks for this awesome soup. Thank you for the glowing review! So glad you all liked it. 🙂 I will work on more strong-flavored fusion foods! They’re so interesting and fun. « Previous PostThis Week’s Bits & Bites: Best of 2012, Being Better in 2013, Charley Frickin’ Harper Glasses!